Bramasol is pleased to announce the release of our new app: "Analytics for Revenue Recognition Disclosure Reporting" that is now available for purchase in the SAP AppCenter. 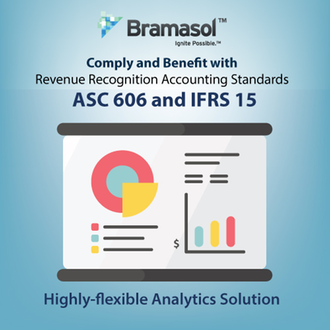 Companies world-wide rely on Bramasol to help them comply with and benefit from Revenue Recognition regulations ASC 606 and IFRS 15. Our IP, Reporting Tools and Experts can help you to meet them. Bramasol is the Revenue Recognition leader and a recognized SAP Revenue Recognition services partner for companies seeking to comply with and benefit from the new Rev Rec standards. This new solution includes highly-flexible analytics that provide companies with the specific quantitative information needed to fulfill statutory reporting requirements and are designed to visually surface any set of relevant information needed to support accurate understanding and timely decision making. Click here to View the Bramasol Analytics for RevRec Disclosures App in the SAP AppCenter.